GLOGIRLY: TV Trip: One-Adam-Chicken, One-Adam-Chicken! KATIE: Waffles, dispatch is supposed to call US. Not the other way around. And "One-Adam-Chicken?" Seriously??? 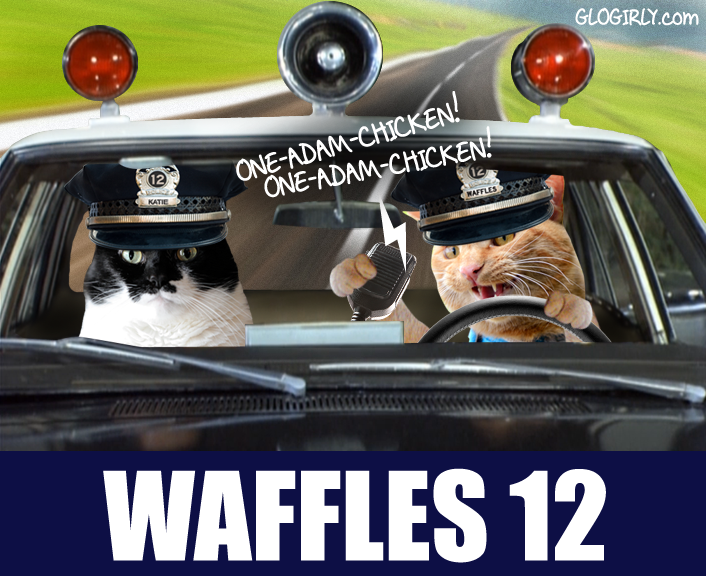 Our car says Waffles 12. Really not much of an improvement if you ask me. WAFFLES: Boss, you're supposed to say over. Over. KATIE: That's just when you're on the radio. So what's this about a 10-63 in progress? Do you even know what that is? WAFFLES: Um, no. But it sounds good. Over. KATIE: You've been watching WAY too much TV, Waffles. WAFFLES: Hey Boss, you want to play with the radio? Over. How about we stop off for a snack? Over. KATIE: How about you hand over the radio and get us back to the station. OVER. Do YOU know what a 10-63 is??? Take your best guess and let us know in the comments! 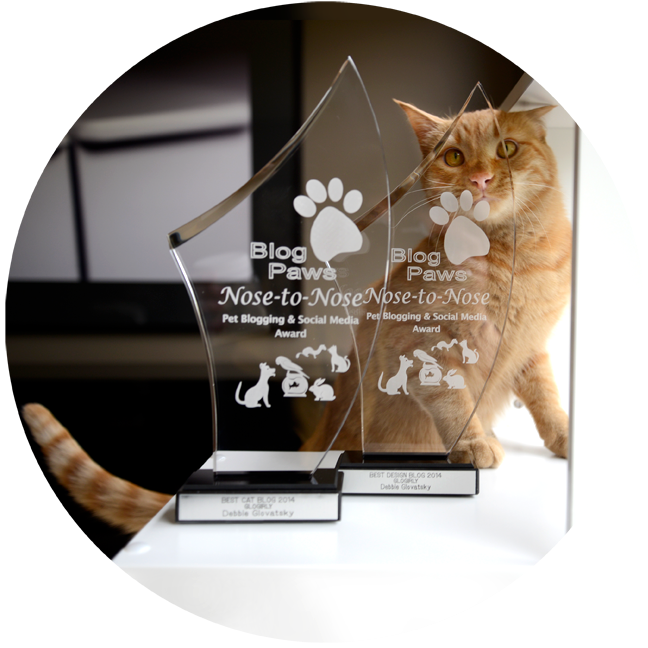 LAST DAY TO NOMINATE: BlogPaws Nose-to-Nose Award Nominations Close at Midnight! 10-63 Somepawdy is stealing Chickenz! or mew can go with the real purrlice code fur 10-63 which is subject positive/prepare to copy mol but I thinkz sumpawdy iz stealing Chickenz! Gabby is right: subject positive, prepare to copy. So we think Waffles has found chickies.... Maybe KFC. yep, 10-63 sounds like someone stealing chicken. What else could it be if it concerns Waffles, that boy and his chicken. If he doesn't watch it he might turn into a chicken himself. Now go get that chicken rustler. Our human does not know what a 10-63 is, but she says she feels about 63 years old! Purrs from Deb and the Zee/Zoey Gang! 10-63 is an unlawful gathering of chickens making fun of orange kitties. Over. Ummm..A stop for lunch at KFC??? or..Prepare to copy.. I don't know about a 10-63 but Waffles should not be allowed anywhere near a radio - he'd be calling for chicken all night long! A 10-63 definitely has something to do with the theft of chicken. Over. Well, the way we understand it, a real 10-63 is "prepare to make written copy". However, since Waffles is repeating it, we assume it means preparing to eat chicken. Would a 10-63 be a toilet paper rampage, Oficer Waffles? Hmmm, 10-63 chick-hen frying in progress, copy that One Adam Chicken. Over. Maxwell: Dood, sounds like you an' Katie are having a bit of a 10-77 there. Allie: Maxie, honestly. *Must* you always be the Nerd? Waff, are you a 12th man?! HA HA HA!!! But we loved that show, however 12 is a popular number around her right now! My human only knows about 5150, but that's because she kind of liked Van Halen at one point. Hmm 10-63 KFC ahead. LOL. Loved this one. Waffles is going to eat CHICKEN!!!!!!!!! I know what is 10-13 is. I yell that every time the sucky thing comes through. 10-13! 10-13!!! Mayday!! Cat down!